How could anybody not be smitten by the Com-Pac CP 23 Pilothouse? It's different from anything else on the market and is a departure for a Florida builder that has been turning out progressively larger vessels in recent years. In essence, the CP 23 is a standard Com-Pac 23 with a different deck. The hull is handlaid fiberglass, the keel is lead encapsulated in concrete, and the deck is cored. A tiny diesel snuggles under the companionway step. The deck and rig are also fairly conventional, with the standard Com-Pac 23 mainsail cut down slightly to clear the new pilothouse. The cockpit is comfortable for two, but snug for three, with a detachable tiller for the times you want to sit outside and sail. Belowdecks is where the CP 23 really shines. In fact, the boat won a 2012 Best Boats award in recognition of its incredible interior layout. There’s much more inside the CP 23 than you would expect, and it feels quite spacious, with six feet of headroom, three full-length berths and an enclosed head. 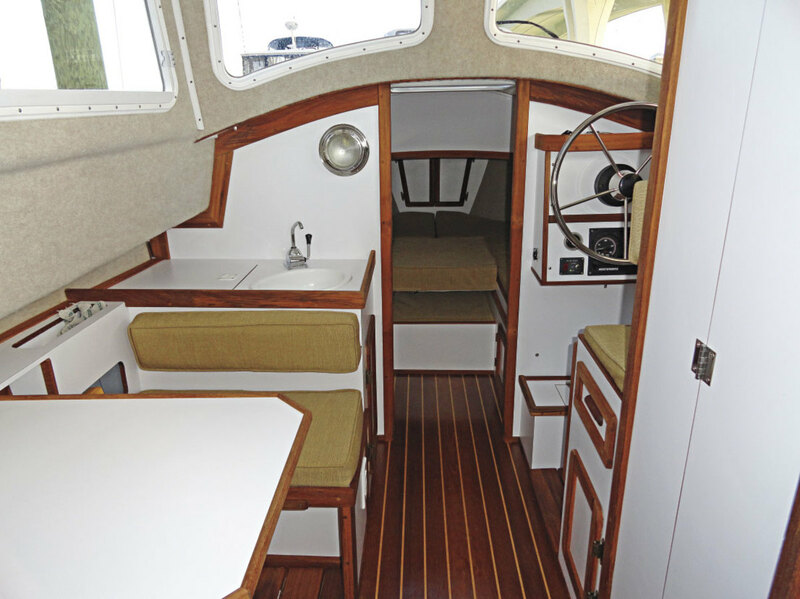 There&apos;s also a little dinette and space for a helm seat at the wheel, with excellent visibility in all directions, thanks to a clever sliding door that lets the skipper see straight through the head compartment. You can stand amidships and touch all these features without taking a step, but they all do fit. One caveat: a cruiser will have to choose between crew and supplies. Two adults aren’t going out with two grandchildren for a week in the CP 23 unless they reprovision every day or two. In 6-8 knots of breeze off Clearwater, Florida, I measured 4 knots of boat speed on a close reach. The CP 23 even kept moving when the wind dropped to only 4 knots. Despite its unconventional looks, this is an actual sailboat, and it tacked easily through 90 degrees without any unusual effort. I think the 135 percent genoa on our test boat is a better choice than the standard 112 percent headsail in areas where the wind seldom kicks up whitecaps. Under power the Com-Pac turned in 1¼ boatlengths and backed precisely. The engine quiets to a moderate 77 dBA and is smoother running at 2,000 rpm than when it idles. This is a capable coastal cruiser in which one owner has already cruised the Bahamas. Demand has been strong, and the factory is currently cranking them out as fast as possible. If you want to trailer a boat to interesting locations and then cruise for a few days in a simple, reliable manner, this boat is a winner.